Over the last few weeks several wine-related posts on smaak.blogo.nl have mentioned and linked to wijnenwijn.nl, a recently launched portal for online wine shops. smaak.blogo.nl is one of the food blogs I follow regularly. It’s the food channel of blogo.nl, a Dutch blog network, and written by professional food enthusiasts. 6 wine-related articles were posted over the course of the last 2 months on topics including Dutch wine and Christmas wine. All posts were written by new blogo contributor Karel Hoenderdos, wine lover, writer and also founder of wijnenwijn.nl. Karel did not fail to link to wijnenwijn.nl in any of his articles – so I was curious on what it had to offer. wijnenwijn has three features – wine news, a wine agenda and search. The news and agenda features are basically empty. The last news article dates from 13 November and there is only a single event – a wine tasting scheduled for 14 December. Then there is the main feature, wine search. There is full-text as well as an advanced search tab where you can filter by country, region, price and other data. wijnenwijn.nl also has some predefined search queries such as “champagne for EUR 30 or more” and a search service where you can ask a question and leave your email address. I decided to test search using two of my favorite and somewhat unusual wines as examples. The first test was searching for Ripasso, a red Italian Valpolicella that is pressed a second time on Amarone grapes. The second term was Pacherenc, a spicy French white wine that I discovered recently and have enjoyed a few times since. wijnenwijn.nl came back with 8 Ripasso wines including well-known Ripasso Tommasi. There was only one result for Pacherenc. For comparison, Dutch wine import database wijninfo.nl contains 23 Ripasso entries and 26 for Pacherenc wines. There is no information such as reviews or descriptions of the wines on wijnenwijn.nl. Also the search parameters are spotty – information about the year was missing on about half the wines, the color was specified sometimes as “red”, sometimes as “red wine” and also often missing, and the price of the Tommasi Ripasso turned out to be EUR 22,95 instead of the EUR 21,95 listed on wijnenwijn.nl. 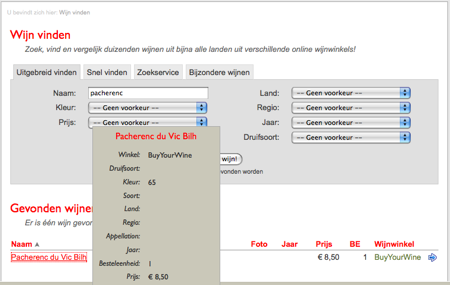 wijnenwijn.nl currently aggregates 13 online wine shops with a total of 4.111 wines. 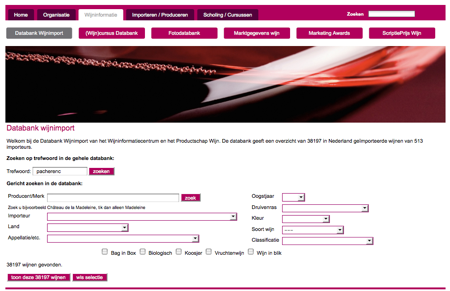 The database of wijninfo.nl that I use frequently contains 38.197 wines from 513 wine importers. In summary, it would be great to have a wine portal where you could find wines, get information and compare prices. However, wijnenwijn.nl currently falls short. There are too few wines and shops and the necessary information such as independent reviews is missing. I will continue to use wijninfo.nl, which has a very complete database, good descriptions and lists shop that sell the wines, although it does not link to them. Next: Momo – the Hottest Restaurant in Amsterdam?